Without a doubt, a Lean consultant’s most important job is to help plant and a grow a culture of continuous improvement in an organization. Planting a seed takes careful nurturing and dedication to actually grow the plant. Once a plant starts growing, it cannot be abandoned. A plant gives warning signs if it is in trouble. If a plant starts to brown, it might need more sunlight. If the plant starts to wilt, it might need more water. Speaking with many consultants, I find that one of their biggest worries is that when they finish an engagement, they will come back a few months later to find that plant that they worked so hard to grow is wilted and dying. An improvement culture cannot be created with a “drop and grow” approach; it needs careful maintenance to grow strong. However, it isn’t easy to measure the health of an improvement culture with spreadsheets or SharePoint files. While a plant gives warning signs in multiple ways, a spreadsheet does not. The only way to know if a culture is failing is that the spreadsheet won’t get filled out. 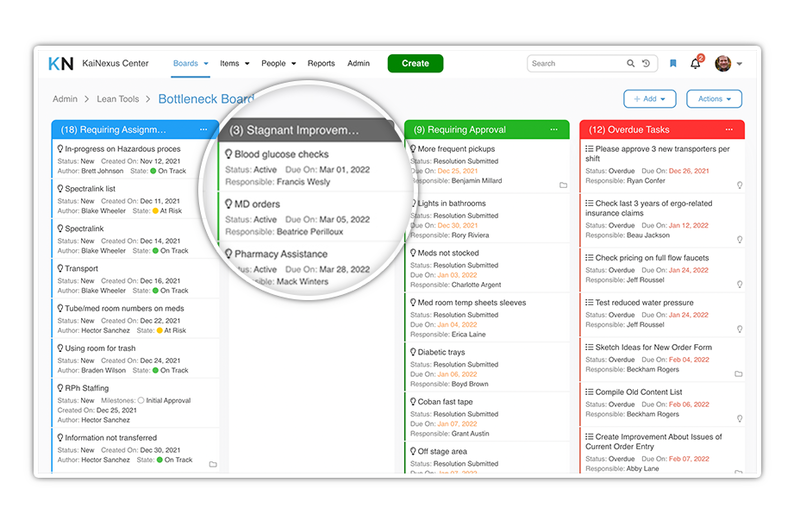 For consultants, bringing a continuous improvement software platform into their repertoire gives them the ability to conduct health checks on their clients without even being in the building. Software keeps track of due dates, engagement and participation rates, giving consultants and improvement leaders added tools to keep growing their culture. 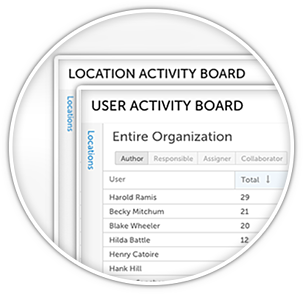 Specific boards and reporting capabilities partnered with powerful filtering features within continuous improvement software give the ability to see not just an entire organization, but to dive down into specific department or location levels. A Bottleneck Board is a board that allows Lean consultants and improvement leaders to monitor improvement ideas that hit snags, or bottlenecks. These bottlenecks could be that ideas are not being assigned in a timely manner, ideas that are severely overdue, or ideas that have been submitted to be reviewed by managers. The idea behind a bottleneck board is that it gives oversight into areas that have becoming sticking points for ideas and allows consultants and improvement leaders to more effectively coach their organizations. The User and Location Boards are great tools that show who is doing improvement work and who isn’t. The lists can show which staff members submitted ideas and how many, or how many are working on improvements, how many are complete, and even separate the improvements that led to a change. These boards can showcase this by individual staff members or widen the scope to see departments or locations. Similar to how the Bottleneck Board can show improvement leaders where to coach based on where ideas get stuck, the Activity Boards show leaders where to coach based on who is doing work and who is not. The User Engagement Summary is a simple way to show who is submitting improvements and who is participating in the discussion. The report calculates Annualized Improvements per Person, which is a great way to stack departments against each other to see who can get the most out of each person. 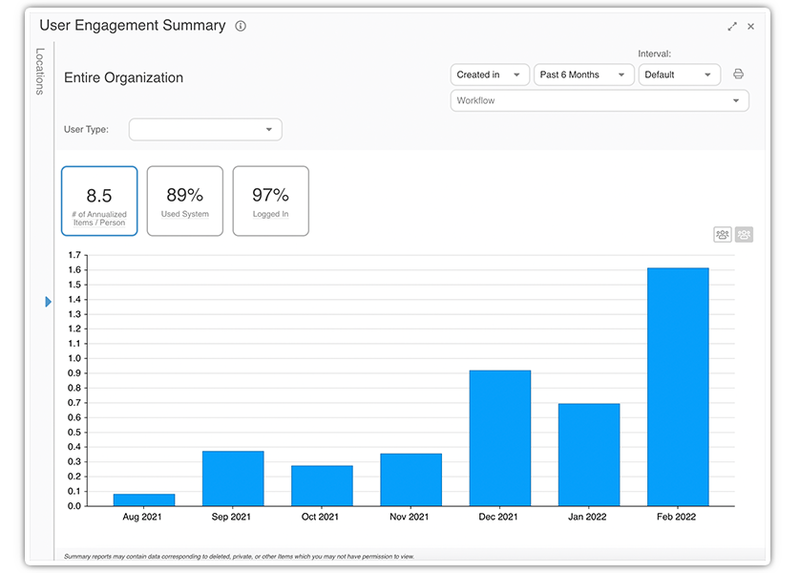 It also provides data on who is participating in improvement work, which is another way that continuous improvement software helps direct coaching. The same can be said about the Location Engagement Summary, except you can use it to track the engagement levels of locations within an organization, giving improvement leaders and consultants the data they need to increase engagement levels wherever they are lacking. Have any questions about how continuous improvement software can help grow your improvement culture? Comment below and I’ll be happy to help you out!